Charlotte's Web is licensed by Dramatic Publishing to middle schools, high schools, colleges, and community theaters worldwide. Strouse noted that the musical's film rights were held by others and that no New York producer would invest in the show without the film rights, so the musical was produced in regional theaters. Thomas S. Hischak (Professor of theatre arts at the State University of New York College at Cortland) mentioned that the musical has not played in New York City, but has had many productions in schools and other theatre organizations. Joseph Robinette, a retired professor of speech and theatre at Rowan University, wrote an authorized stage play with E. B. White. 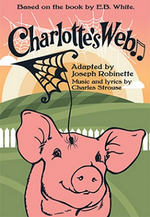 The Strouse/Robinette musical Charlotte's Web premiered at Opera Delaware in 1989. Actors' Playhouse Musical Theatre for Young Audiences presented the piece in 2006–2007 at the Miracle Theatre in Coral Gables, Florida. The musical was produced at the Gordon Craig Theatre, Stevenage (England) in April 2015. Doc, Sadie, and Lurvy marvel at the beautiful morning ("What A Morning"). Breakfast is underway at the Arable house, but when Fern and Avery ask why Pa was up late last night, discover the newborn pigs, and that he is planning to kill one, Fern runs to save it ("Breakfast At The Arables"). He finally gives in and lets her keep the pig, and Ma goes in the house to find a baby bottle while Pa and Avery follow. Ma asks Fern what she plans to name the pig, and she decides to name it Wilbur ("Wilbur"). She goes inside for breakfast while Wilbur eats his own ("Eating"). Pa then decides Wilbur needs to be sold, and he is bought by the Zuckermans. He is quickly welcomed to the barn by all the animals, ("Nice To Meet You"). That night he is lonely and hears a voice claiming to be his friend. She says she will introduce herself in the morning. The next day he is shocked to find his new friend is a spider named Charlotte, but he doesn't mind ("Who Says We Can't Be Friends?"). Edith and Homer Zuckerman are going over 'Honey Do Lists' when they decide to put the work off until fall ("Summer"). The barnyard animals soon begin talking to Wilbur, and he learns his fate. Charlotte vows to save him; that night she carries out her plan ("Charlotte's Spinning Song"). The next day he sees an opportunity to run away, and the animals advise him to do so. But Charlotte warns he will die in the wild ("Freedom Now!). After the chase, everyone takes notice of the words 'Some Pig' in her web ("Some Pig"). The animals are thinking of a new word to put in the web and they come up with 'Terrific'. Charlotte works on it ("As The Day Went On"). The next day, Ma and Fern come down to see it, and have a heart to heart ("Mama, You Don't Understand Me"). The reporters and townspeople notice and pressure Homer to take Wilbur to the County Fair. He gives in ("County Fair"). The townspeople are at the fair ("County Fair (Reprise)"). Fern and Avery soon want to go off by themselves, But the parents give them a list of don'ts. After they leave, Fern and Avery mock them ("Don't"). Charlotte and Wilbur are now comfortable in his stall, but when he sees the pig next door, he is worried. Charlotte reassures him that it will be fine ("You're You"). She then writes another word in her web to get him more attention ("Charlotte at Work"). When she is finished, she has written the word 'Humble'. The next day everyone is sad to find that the pig next door has won the blue ribbon. But their spirits are lifted when Wilbur wins a special medal ("Wilbur (Reprise)"). When it is time to leave, Charlotte cannot leave, because she is dying. Wilbur takes her egg sack to hatch them. When they do, the animals are overjoyed ("Finale").